Biodegradable non-toxic formulation that offers complete neutralization of unpleasant odors by modifying odors (including skunk odor) at the source, without heavy perfuming. Absorbs and destroys odor on contact, while leaving the air fresh and clean. Controls a wide range of odors and is ideal for use in barns and livestock areas, as well as for common odors in the home. 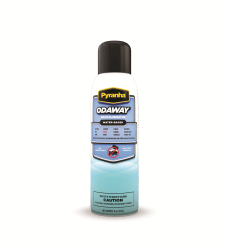 Odaway® can be misted in the air or applied directly to the source of unwanted odors. Options: 15 oz. 32 oz.